Let this heavy duty 18" diameter auger take the effort out of digging the right sized hole for the task at hand. A great addition to the Dirty Hand Tools Model 110 3-point tractor driven post hole digger. This auger typically used for Category 1, 2, and 3 tractors. Can be used on the Dirty Hand Tools Model 100, and Model 110 post hole diggers (SKU 100498 and 100624) and tractor mounted post hole diggers that require an auger with a standard 2" shaft. 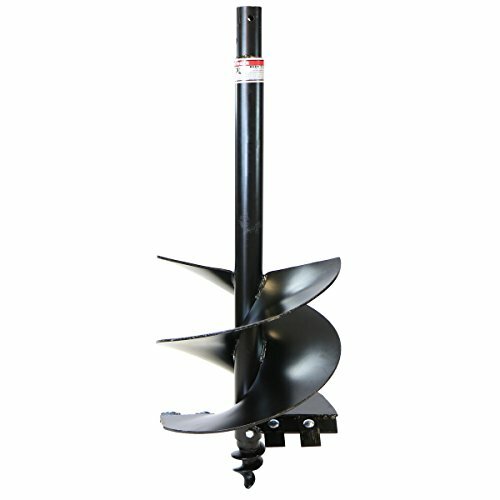 RanchEx brand augers are designed to fit Dirty Hand Tools and other manufacturer's augers. Takes the effort out of digging the right sized hole for the task at hand. Typically used for Category 1, 2, and 3 tractors. Can be used on the Dirty Hand Tools Model 100, and Model 110 post hole diggers (SKU 100498 and 100624). Commercial grade with replaceable carbide cutting teeth. Spiral tip for easy digging (tip is replaceable).